Shoulder Pain, Rotator Cuff syndrome, Tendonitis, Bursitis, and Impingement Syndrome. These closely related conditions may occur alone or together. If the rotator cuff (the muscles that twist the arm) and bursae ( bags of fluid that stop the muscles rubbing on the bones) are inflamed, and swollen, they may become squeezed between the head of the humerus (upper arm bone) and the acromion (top of the shoulder blade). Repeated movement of the arms, or the aging process of the muscles and tendons of the shoulder can lead to shoulder pain. Impingement syndrome occurs when the rotator cuff tendons rub against the roof of the shoulder, the acromion. The shoulder is made up of the scapula (shoulder blade), the humerus (upper arm bone), and the clavicle (collarbone). The rotator cuff muscles are called: the supraspinatus, infraspinatus, teres minor, and subscapularis, and attach to the bones of the shoulder .They help move the arm outwards and rotate the arm. They also help keep the bones of the arm closely together to prevent injury. A bursa ( sac of liquid to prevent tendons and muscles fraying as they rub over bones) is located between the acromion and the rotator cuff tendons, to stop them rubbing against each other. Impingement is when the tendons or bursa are pinched between the humerus (arm bone) and the acromion (top bone of the shoulder). When the arm is used above shoulder height everyone will get a bit of impingement, but this normally doesn't cause any trouble. However, with prolonged or repeated movements, the structures can get worn, inflamed and painful. This can also cause swelling and pain in the bursa. With wear and tear bony outgrowths called spurs can occur which further irritate the area. In the early stages you will find the shoulder just aches, particularly when moving your arm outwards or reaching for your back pocket. Later you may notice that lying on the affected side wakes you up. You may also notice that your arm becomes stiffer and more painful as it gets worse. Sometimes the supraspinatus tendon can become so worn that it snaps leading to weakness in the arm. Your Osteopath will take a careful case history and then examine you in great detail, noting your ranges and quality of movement. He will do minor tests for trapped nerves, ranges of movement and power, and in rare cases may request an X ray or MRI scan. Although shoulder pain can be serious, the vast majority of injuries are not and can easily be helped by your Osteopath. He should normally be able to reduce your symptoms to a pain-free level and give you advice and exercise to help prevent future problems. 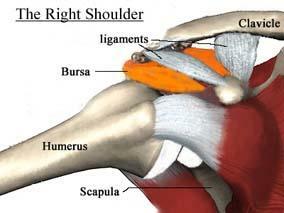 NB Shoulder problems can take a very long time to settle down, 3-6 months would not be unusual. The sooner you seek treatment the quicker you will be better. It was once said by the tennis player John McEnroe's Osteopath that "a shoulder problem will take one month to settle for every week you leave it!" Although not strictly true it can act as a fair rule of thumb! This is one of the most common conditions that Osteopaths treat and often a patient can be helped by carefully prescribed Osteopathic treatment and advice! Sometimes a cortisone injection or surgery would be the preferred option but your Osteopath will be able to advise you on this.